become best-selling lines for Carl F Groupco. In less than a year, Cotswold Architectural Products have become Carl F Groupco’s primary supplier of friction stays. Since introducing the company’s main range to its catalogue in April 2012, lines including the standard Sinidex, the Restricted, Egress and Egress Easy Clean have become best sellers for the hardware distributor. 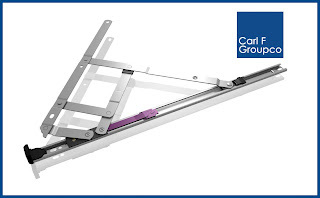 Other Cotswold products supplied by Carl F Groupco include the Extreme Standard and Extreme Egress Easy Clean, which enable side hung applications with up to 35kg sash weight (950mm max width): the heavy duty friction stays are therefore ideal for use with triple glazed windows. Cotswold Architectural Products is widely recognised as a pioneering hardware innovator: the company is acknowledged as the first UK operation to manufacture friction stays.